Some day, all cars will have normal three-prong power outlets inside so that you can plug in anything you want and charge it up. Until then, you might not even realize how cheap it is to add them to any car. 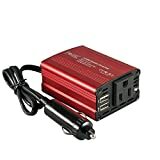 The Foval 150W Car Power Inverter connects to your car’s power port and adds a full three-prong outlet as well as two USB ports. It’s a must-have in any car, and it’s on sale right now at a discount.